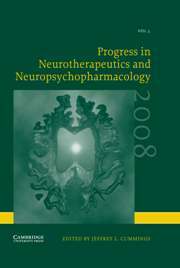 Progress in Neurotherapeutics and Neuropsychopharmacology is an essential update of recent trials in all aspects of the management of neurologic and neuropsychiatric disorders, and will be an invaluable resource for practising neurologists as well as clinical and translational neuroscientists. Published annually, the series provides readers with updates of recent clinical trial results, impacts of trials on guidelines and evidence-based practice, advances in trial methodologies, and the evolution of biomarkers in trials. The series focuses on trials in neurotherapeutics, including disease-modifying and symptomatic agents for neurological diseases, psychopharmacological management of neurologic and psychiatric illnesses, and non-drug treatments. Each paper is authored by a leader in the area of neurotherapeutics and clinical trials, and the series is guided by an editor-in-chief and editorial board with broad experience in drug development and neuropsychopharmacology.